“Reference lines” assist with filing or routing correspondence. A reference line can refer to your files and/or your reader’s files. Place your reference line before the salutation. Sometimes to speed up the handling of your mail, it may be wise to use a subject line. Placed after the salutation. The “identification line” gives the initials of the person who typed the letter. For example, if Diana Michelle Smith typed the letter then she would put dms as the Identification Initials. This is usually not necessary nowadays as most people (even big CEOs type their own letters) don’t have a secretary to type their letters. The “enclosure notation” goes flush left two lines below the signature block or the typist’s initials, if they’re included. Identify each and every enclosure that is being sent so that the reader will know if something is missing from the packet. Use cc, meaning carbon copy, even though you may use photocopy or other reproductions. This notation goes at the very end of your letter and flush left when used in a correct business letter format. If you do not want your reader to know that you are sending a copy to another person, omit cc and instead, type bcc, blind carbon copy, only on your copy of the letter. Below are the ways to present this feature. 2) to be informal and personal. P.S. Just return the enclosed card to see if you aren’t pleased with the service you receive! PS. Give my regards to the others who had a part in making the program such a success. The use of PS before the message is optional, but I prefer if it is there. It helps gets the readers attention. Although this page is about business letter format and this site is about writing business letters, I think it is prudent to talk about other types of written business correspondence. This will include the fax, memos and e-mails. Knowing when to use each type of correspondence is just as (if not more) important as the content itself. For example, you don't send a memo to congratulate someone. The facsimile machine has dramatically changed the pace of business communications in the past 10 years. Some say it is a blessing and some say it's a curse. Either way, knowing the proper use of this communication tool will help you improve your business image. Often, fax transmissions are received in a common area and then forwarded to the proper recipient. The fax cover page is used to route your communication to the correct person and to ensure all the pages are received. In addition to the cover page, format the message in either the memo or business letter format. Do not send documents in which the appearance is important. Avoid dark areas such as graphics. It slows down transmission time and the recipient printed fax may be moist from the heavy application of ink. Use simple, legible type for your fax. Arial, Courier and Times New Roman all transmit clearly. Use at least an 11-point in size. Avoid handwritten notes. They often don't transmit well. If you are faxing a letter, be sure to follow the correct business letter format as above. The memo is short for memorandum. It is used for short reminders, quick announcements or concise pieces of information. When using the memo format, don't communicate something of vital importance. Use the business letter format instead. Memo tends to be given less attention than a business letter written on the company letterhead. Memos should not be used for communications to people outside the company. There is no rule for the format of the memo. Pick one and make it a standard for your company. The vital information in a memo are the date, the recipient, the sender and the subject matter. Since you are on the internet reading this site, I would assume that you know what e-mail is and you probably have one or more e-mail account. The e-mail has replaced many functions of the business letter. Here are some tips on writing effective e-mail. Format: Do use the format provided by the software properly. Include the e-mail you are sending to on the proper column. To is for the individuals the letter is directed to, cc for those you want to have a copy and bcc to those you want to have a copy but don't want people to know they are in the list. And do fill in the subject line. Begin the e-mail with the salutation. Contents: As with the business letter, keep it brief. All the business letter essentials apply to the e-mail as well. Links: If you are referring to a web site, do provide a link. Don't use ALL CAPS: In the real world, all caps mean that you are stressing a point. However when online, all caps means that you are YELLING! Bold the word or put asterisks around it to stress the word. Don't get too informal: The tendency when it comes to e-mail is to write less formally, just remember, you are still writing a business letter only via e-mail. Do use the advice on business letter format above. Just because you are sending a letter via email does not mean that proper business letter format do not apply. 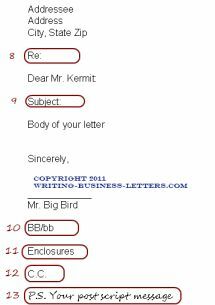 So there you have it, I have given you the elements of a correct Business Letter Format. Some of these elements are flexible, so always make your own judgment when selecting your Business Letter Format.